John Reeves is the author of The Lost Indictment of Robert E. Lee: the Forgotten Case Against an American Icon (Rowman & Littlefield, 2018). In hindsight, the impeachment of Andrew Johnson appears to have been overly political. He was charged with violating the Tenure of Office Act, a hastily conceived federal law that may have been unconstitutional. Johnson’s opponents also accused him of bringing “into disgrace, ridicule, hatred, contempt, and reproach, the Congress of the United States.” Surely that last accusation was far too trivial to result in a president’s removal from office. This book rarely mentions Trump, but his possible impeachment lurks in each of the chapters. If Trump is eventually found to have committed “high crimes and misdemeanors,” then he can be removed from office, under Article II, section 4 of the Constitution. History shows that bringing an impeachment case against a sitting president will be extremely difficult and disruptive, however. Richard Nixon was the only president to be removed by the impeachment process, and he resigned before formal charges were voted on by the full House of Representatives. Impeachment has been so rare in our history that it’s unwise to generalize too much about it — the sample size is just too small. Both Andrew Johnson and Bill Clinton violated specific laws, though it’s debatable whether or not they should have been removed from office. The case of Richard Nixon was far more clear-cut. Most historians agree that he was guilty of “high crimes and misdemeanors,” regardless of how that somewhat ambiguous charge is defined. Toward the end of his presidency, Nixon’s colleagues were concerned about his mental health. In The Final Days, by Bob Woodward and Carl Bernstein, we see the President walking the halls of the White House late at night “talking to pictures of former Presidents — giving speeches and talking to the pictures on the wall.” In Nixon’s case, the right outcome was achieved. The United States Constitution prevailed in the end. Jon Meacham does a fine job discussing the fascinating and highly complex case against Andrew Johnson. Radical Republicans were desperately looking for a reason to get rid of Johnson, who they found to be detestable and dangerous to Congressional Reconstruction. Meacham wisely asks, “Should Congress — could Congress — remove a president for political and temperamental reasons, or was impeachment to be reserved for unambiguous violations of established law?” Here is one of the first big lessons from the book. Meacham believes that a clear violation of the law must occur before a president can be removed from office. Presenting the arguments of the man who cast the decisive ballot in favor of acquitting Johnson, Meacham writes, “For better or worse, the framers intended America’s to be a popular, not a legislative government. The voters acting through the electoral process, not lawmakers in parliamentary setting, were to determine the occupant of the presidency.” This assumes, of course, a possibly delinquent president would allow the voters to make such a determination. In the case of Andrew Johnson, Charles Sumner had his doubts. Timothy Naftali’s essay on Nixon reads like a page-turner, even though we know how it all turned out. The evidence against Nixon was overwhelming. And his countless lies and attempts to obstruct justice were astonishing. Nixon’s resignation was never a sure thing, however. 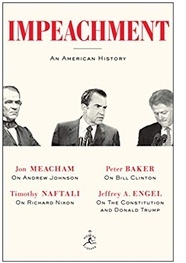 Naftali writes, “Law enforcement and the judiciary had evidence of Nixon’s criminal behavior eight months before he left office, and yet there was no predictable way to ensure his removal.” This is another important lesson from the book. Modern presidents have tremendous power and can use it to stymie investigations. A rare moment of bipartisanship on Capitol Hill during the summer of 1974 ultimately led to Nixon’s resignation. As Nixon’s approval ratings plummeted, several Republicans withdrew their support for the President. “For four weeks in 1974,” Naftali reminds us, “a handful of elected representatives found that something greater than partisanship could guide them when the fate of the country hung in the balance.” One can’t help wondering if contemporary politicians are still capable of coming together in a moment of crisis. The authors imply that the American people and their elected representatives will eventually do the right thing if the evidence of Trump’s wrongdoing is compelling enough. I don’t share their optimism. Perhaps that’s my only criticism of this excellent book — its overall outlook represents the triumph of hope over (recent) experience. Two months after Andrew Johnson had been acquitted by just one vote in the Senate, Thaddeus Stevens considered introducing additional charges against the President. Stevens, who shouted after the Johnson verdict, “the country is going to the devil,” couldn’t rest until justice was achieved. Yet, Stevens knew it was a quixotic effort, declaring, “I have come to the fixed conclusion that neither in Europe nor America will the Chief Executive of a nation be again removed by peaceful means.” Stevens, who was dying, nonetheless felt it was necessary to restate the case against tyranny. Pleading that “we must remember not to place our trust in princes,” he warned his fellow Americans that even the richest heart “may be the abode of malignity, avarice, corroding lust, and uncontrollable ambition.” Stevens decided against bringing new charges, in the end. He died several weeks later. In 1875, Andrew Johnson would return in triumph to the institution that almost convicted him, as a United States Senator from Tennessee.